MATERIAL HANDLING SOLUTIONS FOR YOUR INDUSTRY Combilift is the leading supplier of customised handling solutions with guaranteed improved storage capacity, safer product handling and increased productivity. LIGNIA WOOD COMPANY BRANCHES OUT INTO EUROPE AND ASIA Modified timber business LIGNIA Wood Company has announced a new distribution partnership with Global Timber covering much of Europe and South East Asia. Global Timber, based in Aarhus in Denmark, is one of Europe’s leading timber companies and has the largest warehouse in northern Europe for hardwoods, with stock purchased on six continents. In addition to its European sales, it also has a significant presence in South East Asia. The agreement between LIGNIA and Global Timber covers an initial five-year period. LIGNIA Yacht will be sold across Europe on a joint exclusive basis and LIGNIA and LIGNIA Fire (the latter when it comes on stream in 2019) across the Nordic countries exclusively. Global Timber will also sell LIGNIA and LIGNIA Fire in South East Asia via its offices in Malaysia. LIGNIA is FSC-certified softwood that is modified in the company’s From left to right: Peter Baek, CEO Global Timber, Steve Rogers, commercial director LIGNIA and Kasper Fredsted, creative director Global Timber. providing our customers with the most innovative products on the market. Northern and Southern Irish market. president of the Södra Wood business area. customers. They could continue to be supplied out of our distribution terminal in Wicklow, Republic of Ireland, or in the event of a hard border, supplying out of Dundee, Scotland, may be more convenient. Whatever the outcome, we’re well placed to cope with any potential Brexit challenges. “That said, while Södra Wood (Ireland) Ltd will certainly help combat any potential post-Brexit issues, the investment in Ireland is much more far-reaching. Along with Sweden, Holland and Great Britain, Ireland is very much a key market for Södra and an integral part of its long-term strategy. We’re keen to continue to support the growth of the Irish economy, regardless of the political environment.” Guests left the event with their very own sapling, direct from Södra’s nursery in Falkenburg, Sweden, where 36 million saplings passed through last year. needs across the UK and in continental Europe. Online resources to help you specify and build robust and long lasting decking and cladding structures in wood. Your route to independently accredited materials, accessories, designers and installers. Independent inspection and expert witness services. 5C Flemming Court, Castleford, WF10 5HW  01977 558147  info@tdca.org.uk  www. tdca.org.uk The TDCA is an independent, technical and advisory body for the timber decking and timber cladding industry. It was established to promote the materials, design and installation practices required to create good quality decks, associated landscape structures and cladding on buildings. period of 12 months, starting on 1 March 2019. Scotland including an area near Loch Ness. first Modern Apprenticeship in Trees and Timber. to study and work at the same time. receiving a range of industry relevant and personal development training. SVQ2/3 qualification from the Scottish School of Forestry, Balloch. and its BSc (Hons) Forest Management. economic health of the nation. housing is imported from Europe. DELIVERING HIGH QUALITY TIMBER SOLUTIONS FOR DECADES FOR MORE INFORMATION Visit: www.kopperspc.eu Email: kpc@koppers.eu Call: +44 (0)1628 486644 Fax: +44 (0)1628 476757 Protim Solignum Limited, Fieldhouse Lane Marlow, Buckinghamshire SL7 1LS Protim Solignum Limited trading as Koppers Performance Chemicals. Koppers is a registered Trademark of Koppers Delaware, Inc. Whilst every attempt has been made to ensure the accuracy and reliability of the information contained in this document, Protim Solignum Limited gives no undertaking to that effect and no responsibility can be accepted for reliance on this information. Information will be updated when the need arises. Please ensure you have an up to date copy. All products are produced by independently owned and operated wood processing facilities. All other trademarks are trademarks of their respective owners. Koppers Performance Chemicals, Protim Solignum Limited, Fieldhouse Lane, Marlow, Buckinghamshire, SL7 1LS. Visit: www.kopperspc.eu, 07	WWW.TIMBERMEDIA.CO.UK	Email: kpc@koppers.eu, Call: +44 (0)1628 486644, Fax: +44 (0)1628 476757. Registered in England 3037845. ÂŠ Copyright 2018. TRUST IS BUILT Experience you can trust. Founded over 30 years ago by a group of timber and building materials dealers, Spruce was built specifically for your business. Spruceâ&#x20AC;&#x2122;s point of sale and business management solution reduces costs and simplifies your processes, helping you profit and grow. ECi, ECi Spruce, and the ECi Red Box logo are trademarks or registered trademarks of ECi Software Solutions, Inc. All rights reserved. he British Woodworking Federation (BWF), the trade association for the UK’s woodworking and joinery manufacturing industry, is on a mission to promote the UK’s exceptional woodworking skills and the benefits of building with wood. aims to make wood the construction material of choice by celebrating its many benefits in the built environment and promoting the vast range of woodworking and joinery expertise available in the UK. standards for the sector, as well as working with schools, to attract more young people into the sector. “Apprenticeships and the skills agenda is challenging and we want to make sure that people have access to good provision,” said Hewitt. BWF, which has over 700 members. providers take up those standards. promote and encourage high standards. Before joining the BWF, all members undergo a robust audit against the code’s standards, covering areas including customer care, technical expertise and training, environmental impact and waste management, sustainability, financial stability and compliance with health and safety legislation. The membership journey is key for Hewitt, a previous membership director of the BWF, who took over as chief executive in November, having held the role on an interim basis. “I am very focused on the membership journey – so when we bring in a member it is very much about ensuring that they understand the values of the BWF – and also on retaining members,” she explained. very little recognition for their work. out more about the work of the Lumberjills. obsession with them,” she explained. Army and Women’s Timber Corp.
conscientious objectors and school boys. told Foat that she need something more to go on. that Foat first met Lumberjills Eileen Mark and Audrey Broad, whose stories feature in the book. having never heard of the Women’s Timber Corps. Women’s Timber Corps,” explained Foat. hear their accounts first hand. an enormous task it was, but I was just so fired up about it. up friendships that lasted a lifetime. Danzer is a leading quality hardwood supplier with in-house production facilities in many parts of the world. Founded in 1932, Danzer is a third-generation family business producing lumber, sliced veneer and innovative value-added wood timber products for decorative purposes. Danzer products are ultimately used in many high-quality joinery, furniture, interior and external architectural, automobile and yacht interiors and numerous other high class applications. YOUR RELIABLE PARTNER FOR CONSISTENT QUALITY The global Danzer operation embraces the whole supply chain: from sustainable forest management, sawmilling and lumber sales to the manufacture and sales of veneer and other hi tech speciality surfaces. This allows Danzer to directly manage a consistent quality at all stages. SAY WHAT YOU DO - DO WHAT YOU SAY - PROVE IT! Danzer continuously invests in modern technologies and processes to ensure optimal use of hardwood – a precious resource – and keep waste to an absolute minimum. Wood is a sustainable natural material. The company adheres to strict due diligence procedures when it comes to procuring its hardwoods. Danzer is FSC® Certified (license FSC-C022523) and PEFC™ certified (PEFC logo license PEFC/1637-165) for applicable products. Danzer UK’s NEPCon LegalSource(TM) certificate demonstrates that their due diligence system conforms to EUTR requirements. Ongoing dialogue with all stakeholders: Danzer are engaged in an ongoing dialogue with various international non-governmental organizations (NGO’s) and local social project groups. In doing so, Danzer always pursue the goal of keeping debates objective and finding steps toward constructive action. The aim is to help people find their own way. Working together not only with the local residents, but also with NGO’s, we all learn how to support and promote sustainable development. With its Sustainability Reports Danzer underlines this commitment. The reports are written according to the Global Reporting Initiative (GRI) reporting guidelines. They cover the business years 2014-2016. The reports feature extensive data and examples from around the world that collectively capture some of Danzer’s key sustainability efforts and impacts. The reports serve as a baseline for discussions with stakeholders and future improvements. COVER STORY: DANZER UK DIVERSE AND EXTENSIVE UK STOCKHOLDING Being part of a global hardwood specialist, Danzer UK draws on an extensive in-house manufacturing and procurement network worldwide; this gives access to a reliable supply of a large variety of the worldâ&#x20AC;&#x2122;s finest and responsibly sourced timber products. At the same time, a deep knowledge and thorough understanding of local customer needs and business practices lets Danzer UK offer products and services tailored exactly to local market needs. Specific programs are being run for individual customers. Products are available both from UK stock and direct from one of our manufacturing facilities. 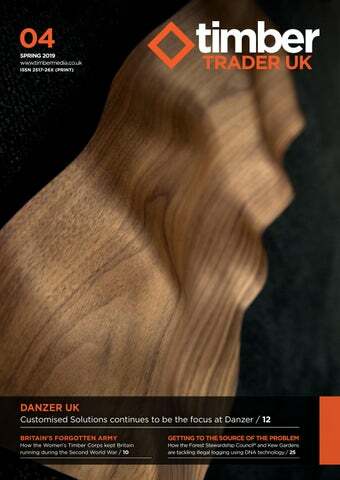 INNOVATIVE NEW WOOD SURFACES Danzer 3D-Veneer as showcased on cover page. allows for the design and industrial production of organic wood shapes. Danzer 3D-Veneer ushers in a new era in wood design: while bending wood was previously restricted by narrow parameters, the introduction of 3D-Veneers opens up completely new possibilities. Danzer now have implemented hundreds of 3D-Veneer projects in a range of industries, including the furniture and automotive sectors. Danzer Freeform is an industrial process that adds metal inlays to wood surfaces. Until now only possible through painstaking handcraftsmanship, or restricted to straightforward linear patterns, Danzer Freeform technology now makes it possible to create veneers with inlays in virtually any shape. Decorative elements, typographical details and even logos can now be added to wood surfaces quickly and at reasonable cost. Danzerâ&#x20AC;&#x2122;s technical capabilities are now so advanced that there are virtually no limits to the type of inlays that we can produce. Industrial production methods deliver additional cost efficiencies while opening up a wide range of potential uses. the type of glue bond were consistently accurate. complex supply chain is engineered wood flooring. We offer one of the largest and most varied ranges of joinery quality hardwoods and softwoods available in the UK. 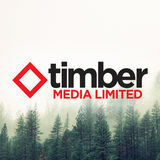 With eight nationwide timber depots, we carry more than 20 species of certified and legally verified timber from Europe, Africa, South America, North America, the Far East and Scandinavia as well as modified wood and our own engineered product, WoodEx, all available directly from stock. Whatever your budget or project requirements, why not allow our extensive range of timber to provide the inspiration. this is where any possible problems may occur. products – as well as modified timber, Accoya, and engineered timber. INTERVIEW: ANDREW WRIGHT operating in the timber industry,” he said. “I am delighted to be heading up a successful team and look forward to all of the challenges and opportunities that lie ahead. We have a very successful business, created by a team of dedicated people working together, so my role as managing director is really quite simple, it is to ensure that we remain focused on the company’s development plans which are well established and ensure that the business is being steered in the right direction. “We have such a wonderful group of people within our organisation – welltrained, well-motivated and well-organised and I think we will continue to manage the business heading in the right direction and I feel excited about the future.” James Latham invests heavily in its employees and staff retention is important to the company which has a long-serving workforce. “I have been with the company 19 years this year and actually I am one of the new recruits in the organisation. A lot of people have worked for the company a lot longer than I have,” said Wright. further develop its operations in the country. buildings and even in the fit out of buildings. Wright was reluctant to be drawn into a conversation on the post-Brexit landscape. He said that the company can only focus on aspects that are under its control and James Latham has a good business model, which it will continue with. pleased to have a long history and association with this great industry. the circumstances,” said Wright. “It is a challenge for sure but I think we have done everything that we can. WoodScanner is a ground breaking digital B2B marketplace that will openly connect members (buyers) with our partners (sellers) providing a simple, efficient and hassle free way to acquire timber products. Save time Quickly search and find Timber products and services in one place Know youâ&#x20AC;&#x2122;re getting the best price View product availability and get real time price comparisons across multiple suppliers Save money Make your purchasing decisions with complete visibility and awareness of possible options Convert more sales opportunities Turn enquiries into orders by giving your team the tools to find and quote on non-stock products quickly. Unlock your own marketplace Become more visible to your potential customers and join our community of best brands Low cost market penetration Improved efficiency through the digital process and adding additional trading channels for B2B connections Real time stock dashboard Allow the marketplace to view the inventories that you wish to price and display Smartbasketstomaximisespend We will help customers to reduce total costs, improving transport utilisation by displaying the savings available for half and full loads. STAMP OF APPROVAL Sustainably managed forests can protect wildlife, local communities and the wider environment from the devastating consequences of deforestation but how can you ensure that the timber you procure has been responsibly sourced? depending on them for their livelihoods. LIGNIA® is ‘wood made for life’, beautiful, durable and highly sustainable. It starts out life as a softwood, from FSC® managed plantations, and we then modify it, giving it all the properties and beauty normally associated with hardwoods. those credentials to the next person in the chain. relating to water, biodiversity, climate change and carbon sequestration,” he said. certified to an SFI standard. continuing compliance in the UK. of-the-art technology, machinery and expertise. The addition of Sansin’s Precision Coat factory finishes combines both the beauty and protection of a class-leading product with the commitment to quality manufacturing and attention to detail for which Dresser Mouldings is known.” Offered in a variety of stunning colours, Sansin’s Precision Coat factory finishes include; Precision Coat SDF for wood siding, cladding and decking; Precision Coat Foundation, a penetrating base coat that offers up to six months protection against weathering and UV during construction; Precision Coat ENS, a self-priming and tough, durable satin two-coat finish that can be applied to virtually any surface – from millwork to cladding and decks; and Precision Coat WoodForce, a durable, water repellent wood treatment for exterior wood surfaces designed to achieve a natural weathered look, while ensuring dimensional stability by reducing moisture absorption up to 74% during wetting periods. TFC Supplies LTD FEATHER EDGE BOARDS CLOSEBOARD PANELS & MORE! and help mitigate against these risks. timber producing regions in the world. wood to the genus level and cannot provide information about where the wood was grown. with accurate geo-referencing,” explained Peter E.
or diseases that could affect plants in the UK. their natural range,” explained Guillery. supply chains with scientific methods. identify the isotope signatures for wood is similar. to our system,” said Guillery. Improve efficiency and reduce costs across your business Kerridge Commercial Systems - provides business management software solutions for the timber industry. aims to celebrate the individuals working to protect the planet’s trees. tackle illegal logging,” explained Environment Minister, Thérèse Coffey. through the UK Government’s Darwin Initiative. £1m in backing from the Darwin Initiative, with some UK aid, over this period. to leave our environment in a better state than we found it,” said Coffey. Development Programme’s Equator Prize award in 2015. Guinea become para-ecologists and protect their country’s treasured rainforest. from logging by nine neighbouring indigenous clans. RCM and their sister company SPSenvirowall are happy to announce a successful show at Futurebuild 2019 in London. Both part of the Benx Group, the companies shared a large and visually exciting new stand showcasing their joint product offerings. Greater depth and diversity of products on offer demonstrated integration capability and successful one-stop solutions. The prime position at the show together with the very clean and slick white design of the new stand allowed the samples on display to virtually present themselves. Various ranges of colourful facades and brick finishes compelled visitors to take a closer look. Suspended 360-degree rotating interactive displays of RCM’s ‘complete through wall solutions’ and SPS’s ‘system build-ups’ allowed visitors to get a much better understanding of how the different products integrate with each other to form a solution. Dynamic Cladding, offered exclusively by SPSfacades, part of the Benx Group and RCM’s popular Supertech Weatherboard cladding were also featured, highlighting the great façade options available. Visitors were also able to take away samples of the great building board range RCM have to offer. Visitors will have a chance to visit the new stand at Construction Week, NEC Birmingham 8-10 October 2019. RCM and SPSenvirowall will be exhibiting in the ‘Roofing, Cladding & Insulation’ section on stand: B845. f you’re searching for new business software, you’ll obviously want a solution that manages and reports on everything your business does while at the same time optimising the productivity and efficiency within your operation. file in the system you’ll be able to sell at the best margins and claim the correct amounts. lengths all need to be at a sales team’s fingertips. ability to supply customers with confidence. straight on a lorry, our software supports this too. driven by the specific needs of certain customers. Use wood preservatives safely. Always read the label and product information before use. TIMBERMARK makes progress exporting to Europe Despite Brexit uncertainty making headlines every day, one company still finding exporting success in Europe is high-resolution inkjet printing solutions provider, Timbermark. The Oxfordshire based company says that Euro-area sales now account for about 25% of turnover. trading conditions with the UK, although Colin believes this view is unduly pessimistic. “Even if in the short term we end up leaving with no deal, my view is that in the long run there will be a free trade agreement with the EU.” Meanwhile, the company has written to all its European customers assuring them that there will be no adverse effect, as Timbermark will pay any duty on imports. The only effect will be that the customer will have to pay the VAT to the courier agent, as opposed to including the transaction in their quarterly VAT return. give specifiers and end users alike a much wider choice of materials. information is available, you cannot be certain if the timber is fit for purpose. added reassurance from qualified, expert opinion. to the newer arrivals. For installers of pressure treated timber, it also is incredibly easy to work with, not to mention its versatility which allows much creative freedom. Put renewable, sustainable and environmentally responsible into the mix and its position is easy to understand. joists. Flooring and roofing joists are designed for interior building use and should not be used for external timber decking. The TDCA website features answers to other topical questions and more – pay it a visit at www.tdca.org.uk. that can equally be achieved using pressure treated softwood or naturally durable timber species. homes and to make a striking entrance feature for both residents and visitors. pressure treated timber often branded as Tanalised, although some suppliers have own label brands. HOW DO I KNOW THAT WHAT I’M GETTING OR SPECIFYING IS GOING TO BE RIGHT FOR THE JOB? This is a very good question. You cannot tell if a piece of timber has been properly treated just by looking at it. residents can stop and take in their surroundings. Jane Fortescue, from FPCR Environment & Design said: “The decking gives a clean, contemporary style that is suited to such a large boardwalk and creates a striking first impression”. Antislip profiled deck boards are a good choice for commercial projects to minimise the risk of slipping even in adverse weather conditions. Larch, Red Grandis and Thermowood. BREXIT? Currency and availability of material are probably the two greatest challenges. Sugi Ban cladding is growing in popularity also. PREVIOUS YEARS Cladding sales at James Latham have effectively doubled in the last two years. ECI-Spruce are the leading provider of software to American timber merchants and are now making inroads into the UK market. Their latest enhancement to the core merchant software is Spruce AnyWare; the android App for phones and tablets. This App allows the merchant to access their Spruce merchant business system from the palm of their hand, no matter where they are. With the Spruce AnyWare application management are always in complete control of the business. In its simplest delivery only form the App can be used by the merchant’s drivers to take photos of delivered goods, including their condition and capture customer’s signatures. Both the signature and any photos are attached automatically to the file version of the delivery document being easily retrieved to any work station should the need arise. The app can optionally be integrated with the Spruce delivery module and Google maps allowing inside staff to track the progress of a truck’s journey and update their customers with expected delivery times. The full AnyWare app allows outside sales reps to process customer orders and quotes, check pricing and stock levels or schedule deliveries all whilst sitting with the customer in his site office. Inside warehouse and yard staff can serve customers using the app’s point of sale system which includes bar code reader and customer signature capture. Spruce AnyWare transmits the transaction to the trade counter or yard exit point for a printed advice note or invoice, making it ideal for “drive-thru” yards. Real time stock checks are carried out with instant update to the branch inventory and supplier purchase orders are simply produced and emailed directly from any part of the yard or warehouse. The ECI-Spruce AnyWare App is partnered by the company’s customer App, Spruce Prolink. The Prolink product for Android or Apple mobiles allows merchants’ customers access their account documents, check their prices and place orders 24/7. Decking supply options now include 100% FSC certified greenheart and basralocus Consumer attitudes are a significant driver of innovation in the marketplace. Timber decking in the UK continues to enjoy strong demand, with service life and reduced maintenance increasingly specified requirements. The market segments for legal and sustainable FSC certified tropical timber decking are application, type and usage. Greenheart in particular is a key high performance and durable timber of choice for marine construction applications, commercial docks, public beach-front developments including boardwalks, lock gates, and coastal defences such as groynes. However, with the availability of greenheart and basralocus timber decking from McVantage of Guyana, applications are expanding to hotels and resorts, and use by landscape architects and homeowners for garden renovation projects. There is a notable rise in both specifiers and consumers wishing to address environmental concerns, with the “Plastic & Health: The Hidden Costs Of A Plastic Planet” report released by the Center for International Environmental Law (CIEL) just last month, and increasing interest in the positive impact of wood on physical wellbeing. The stringent regulations the timber industry works within such as FSC and PEFC are familiar and reassuring for clients, specifiers and consumers. Voluntary Partnership Agreements (VPAs) combined with legal frameworks such as the US Lacey Act, European Union Timber Regulation (EUTR) and FLEGT also offer sustainable and responsible social and economic opportunities for tropical timber source countries to cover market needs. McVantage of Guyana produce 100% FSC certified tropical hardwood decking in a variety of species and sizes which are offered untreated and standardized against the rules for GR04 products, as outlined in the McVantage of Guyana Grading Rules Booklet. They are end sealed and packed to length in bundles approximately 12” high and 40” wide. Standard McVantage of Guyana decking is surfaced and finished with a 3mm radius on each edge to avoid hard corners, and a number of moulded patterns, including anti-skid, can be produced. Their decking is available in greenheart and basralocus, with other species subject to availability. McVantage of Guyana is a long-standing US timber company operating in South America in close cooperation with the Iwokrama International Centre for Rainforest Conservation and Development - an international conservatory tasked to develop economically viable, environmentally sustainable, multi-use forest resources from tropical forests. For full details of available species, sizes and lengths, contact Finn Knudsen on +41 79 414 36 81 or email FKnudsen@mcvantage.com. Thereâ&#x20AC;&#x2122;s nothing James loves more than to lose himself in our warehouse, amongst over 16,000 cubic metres of imported hardwoods and premium grade softwoods to find the perfect pack for you. Sole distributors for LIGNIA and LIGNIA Fire in the UK and the Republic of Ireland.